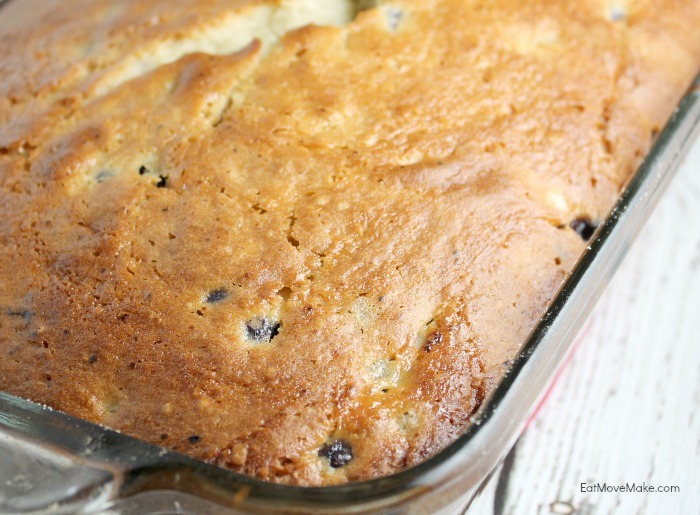 This blueberry lemon coffee cake is so perfect for spring time and delightful for brunch. How can you go wrong with a sweet and tangy lemon filling, a burst of blueberries and a moist and delicious cake? Each bite is as yummy as the next. 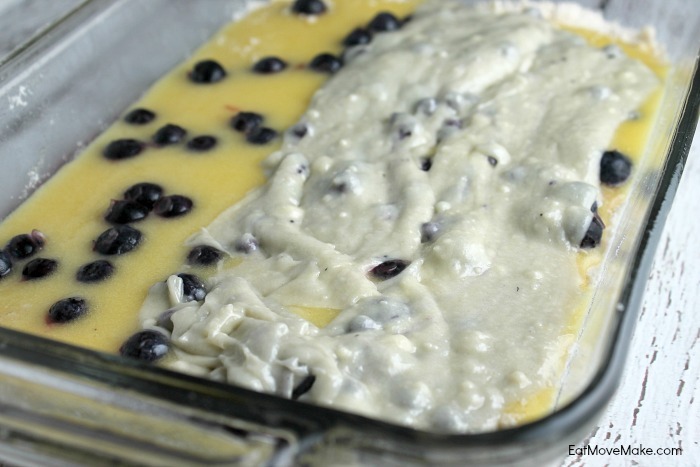 In a baking dish, you’ll alternate layers of filling over the crust, and sprinkle in some fresh blueberries. It’ll swirl together in some spots, and that’s fine. Swirls are yummy! Bake until center tests clean with a toothpick. Let cool; cut into slices and serve. It makes a delicious addition to a brunch menu and goes perfectly with an afternoon cup of coffee or tea as well. I’ve shared the recipe on the Krusteaz website, so be sure to visit and get the full ingredients and instructions. Hi Liz, lovely cake, hope you’ll bring this on over to Food on Friday: Cakes over at my house (Carole’s Chatter)! Visiting from Love of Home! Went over and found the recipe! Looks so so good. My sister is visiting soon, I think it’ll be fun to whip this up for her. Thanks for stopping by the #HomeMattersParty hope to see you back! Oh yes, this is my kind of coffee cake! Pinned, and looking forward to this one, for sure! Oh yum! This looks so good! Thanks for linking up with Merry Monday this week. i’m a midwest girl who would love an excuse to break out a southern accent–it’s so charming! this looks scrumptious and i can think of nothing better to wake up to. plus the blueberries are brain food. 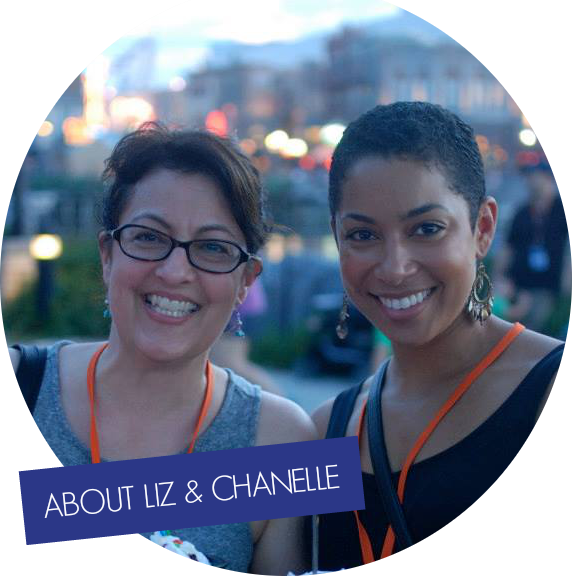 hope you can pop over to my blog if you have a moment to check out what is on my radar. peace to you right where you are. What a yummy recipe! Looks moist and delicious! It seems like the perfect springtime treat! You should come link this up at Welcome Home Wednesdays! Party opens 7a CST. It looks delicious and easy to make! A big plus because I love blueberries! This looks like such a great cake. I know my family would enjoy them. Lemons are one of my favorites. My gosh this looks so freaking nice and moist. Cake is a guilty please of mine for sure. Lemon is in my top five for sure. Delectable! This looks so delish love the combo of flavors! Looks and sound delicious. I love blue berries and that it is made from a mix is a plus. I am very much obsessed with anything done out of Blueberry & this lemon cake looks absolutely delicious. A fruit dessert like this would be a wonderful snack idea for kids as well. Wow, this looks yummy. I really shouldn’t look at recipes hungry! 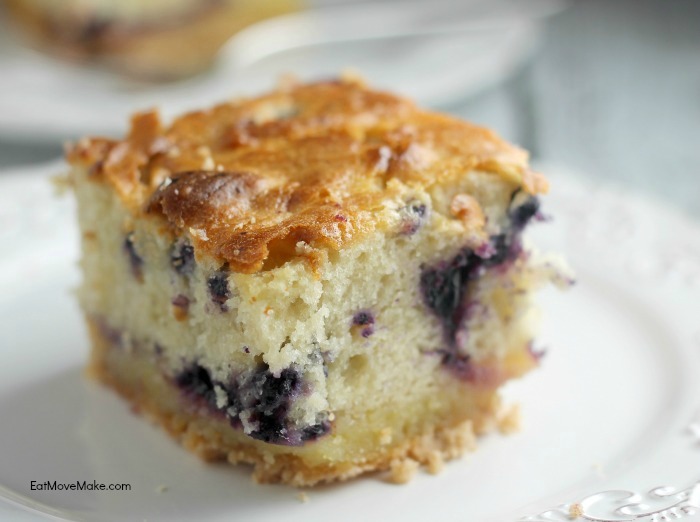 Yummm… this blueberry lemon coffee cake looks so good!! I would love to make it!! My husband would love this bluberry lemon coffee cake. he is always asking for me to bake fruit deserts for him like this. This looks so fluffy and moist! I love how there’s a slight layer of lemon at the bottom. It looks so pretty…and super tasty. I love blueberries. I must run out to the store and grab these ingredients. This looks so delicious! Sounds really delicious. Would indeed make for some yummy brunch desserts. Yummy! Blueberries and lemon go together so well! It’s really great that you can make such a yummy treat using boxed mixes. Have to try it for sure! I absolutely love the taste of blueberry and lemon. This is a recipe I am sure I would eat every last bite! I’ve eaten a lot of lemon-flavored pound cake in my day, but don’t recall having any with blueberries. This sounds like a nice springtime dessert. This sounds so simple and so yummy, I’m going to have to make this for Sunday brunch this weekend! This recipe looks delicious! I love how you managed to easily jazz up a boxed mix too. I love coffee cake so I really want to give this a try! Blueberries are my favorite fruit, can wait until I can buy them fresh & local! This looks incredible! I love the combination of blueberry and lemon flavors. Wow this looks amazing! I would love a slice of this for breakfast! I bet it goes great with a nice cup of coffee! This looks so good. I love blueberry and lemon. I pinned it on my pinterest board. Never thought of pairing blueberry with lemon but it looks sooo good! I will try to make this for dessert, my husband will love it! That would be perfect for breakfast with a nice, hot cup of coffee. I totally need to make this soon. This cake looks so moist and decadent! I will have to serve this for brunch sometime soon! Never thought to put blueberry with lemon but boy does this look scrumptious! I must try to make this for dessert maybe or a weekend treat with the trio! That looks really good. You can tell it’s homemade. I’ve never thought of combining lemons and blueberries. Thanks for sharing! So wishing I had picked up blueberries yesterday. I love anything like this. And lemon and blueberries are one of my favorite combinations, along with peaches and blueberries. I am a big blueberry fan. We usually go to Maine yearly and get the fresh blueberries there. I love this recipe. I have never had blueberry and lemon together in baking before, especially not with coffee cake! I am very interested to try this and see how it tastes. this looks amazing. What a great combo with the blueberries & lemon – two of my faves paired up. This would be great for a brunch after church. That looks really good! It think I’ll try making it to take the next time we go to visit a friend. Ohh – lemon and blueberry are my youngest sons two favorite flavors. I will have to be on the lookout for this at the store and make it for breakfast one morning. I was just looking for something to make for Sunday brunch – I am so excited to make this on Sunday! My stomach started growling while looking at your pictures they are so tasty looking. A very delicious suggestion for a desert indeed. That looks and sounds delicious. It would be perfect to take to a brunch gathering! This sounds so good!! I love to have coffee cake with me tea its a perfect treat and pick me up! Oh yum. I love blueberry and lemon together and I ADORE coffee cake. This would be a delicious combo, I need to try! Loving the flavours of this cake. Coffee cake is so great….I love eating it for breakfast too!! Hope this is THOUGHTFUL and RELEVANT enough: I am going to be making this coffee cake this weekend!! Looks great. I am sure the surprise blueberries in each bite give it a unique texture. I love lemon blueberry coffee cake. My blueberries are almost ready to be picked – when they are, I’m going to try your recipe. I’ve never used Krusteaz to make it. I love their pancake mix, though, so I am willing to try it. OMG I want to make this right now! I love lemon cake but I’ve never added blueberries. They are also one of my favorites. Pinning this. I do like lemon and blueberries together. I went and got your recipe yesterday and made it. So good. That looks so good! I know you could use it for a breakfast, but I think it’s good enough just for dessert! I could eat this for breakfast lunch and dinner. My kinda food! I love coffee cake and lemon and blueberry is a wonderful flavor combination. I need to give this a try! This combination sounds like it would be amazing! Must try! I love a homemade coffee cake. And since blueberry & lemon go together so well, this is definitely a recipe I’d love to try! Thanks for sharing this recipe- I can’t wait to make it! oh I love blueberries and lemons but mixing it with coffee sounds amazing! I love blueberry and lemon flavor combos! This cake looks delish. I’m pinning this to make soon….REAL SOON! That looks and sounds so delicious. The flavors of blueberry and lemon play off each other nicely. I would love to whip up a batch of coffee cake for our gathering this weekend but we don’t have Krusteaz products here in Canada. Do you know of a substitution I could use? I love lemon. I’ve never combined it with blueberries before but it sounds delicious. I will have to give this a try. I love coffee cake, and blueberry and lemon coffee cake just sounds amazing. I would love to make this recipe. This looks so yummy. I can’t wait to make this, blueberries and lemon go so good together. Blueberry and lemon is one of my favorite spring flavor combinations. It’s so refreshing. This looks yummy! The cake looks yummy and moist! I wish I could just grab it from my screen. I like the contrast in taste between blueberry with lemon and coffee. This would really make a great desserts. This looks amazing! My husband is a huge blueberry fan, I will have to try this. That looks and sounds terrific. I totally wish I could try a piece of that right now. That is going on our table for breakfast this weekend. I love the idea of making a cake like that instead of muffins. It looks SO delicious. Blueberries are one of my favorite fruits.This looks delicious! I wonder if this would be more tantalizing than Blueberry Muffins? It sure looks great to me. I have some frozen blueberries left over from last summer. I think I’ll make this for Sunday dessert. Yummy! I wanna grab it form my screen, it looks fantastic. Lemons and blueberries just go together! I wish I had a piece of your coffee cake for breakfast. It looks so, so good – two of my favorite flavors! Krusteaz mixes are so frugal, so this recipe is perfect for me. I love how you combined the 2 flavors together and added some fresh fruit to make it more homemade! Blueberry and lemon together are an amazing flavor combination. This looks so delish! I just bought this brand for cranberry muffins because you often say/show how delicious it is… count me in as a believer. I love it!! The blueberry lemon coffee cake looks so good! Oh boy this looks incredible. The recipe looks easy too! I’m definitely going to make this for my family. They’ll love it. This recipe is just what we need with the arrival of spring. Warmer weather always makes me want lemon. It is such an incredibly vibrant flavor and the blueberries are the perfect addition. Must make this! This seriously looks delicious! Blueberry and lemon make me think of spring and I’m a huge lemon fan!! I must try this. This recipe looks fabulous!!! We love blueberries and I am already looking forward to blueberry picking this summer. I am adding this to my recipes to try once we go picking. This looks so delicious and moist! My family loves blueberry muffins so I think they would really enjoy this new recipe! I love blueberries, lemon, and coffee cake. What a delicious combination! I love making coffee cake for my husband to have for breakfast before work! This is a great recipe to make for him! Blueberry AND lemon? At first I’d say you’re crazy but now I’m just calling you off your rocker! Nah, not really. That looks really good. This looks so good. I love both blueberry and lemon flavors, so I bet they taste amazing together. I’ll have to save this so I can make it later. Yum! This looks so delicious. I think blueberries and lemons taste so perfect together. Coffee cake is my favorite. Looks so fabulous and moist! I love the addition of lemon to the cake. Sounds yummy with blueberries. I will definitely make this on the weekend. It looks so delicious and easy to make. My kids are going to love it. Blueberry and lemon is one of my favorite flavor combinations. I love coffee cake and I think this is going to be my new guilty pleasure! Thanks for sharing this recipe. This cake looks and sounds delicious. Love the lemon and blueberry components- this would be a huge hit in my home. I know my Nana would love it as well.. she could eat sweets all day every day! This looks amazing. I bet this would be great for breakfast with a nice cup of coffee. Yes please! There’s nothing better than a cup of coffee & a yummy baked good as a mid-morning treat. Can’t wait to try this coffee cake. This looks absolutely delicious and easy to make. Perfect for a snack with my morning coffee! Oh yum, I am always up for an excuse to use blueberries. I have a blueberry lemon bar recipe everyone loves, so I’ll have to give this a try- I am sure it will be a hit! This sounds like an amazing coffee cake!! Lemon and blueberries are the perfect spring flavors! Wow love the sounds of that cake. That is a great combination of flavours….I could eat some of that right now!! Oh man, I remember SUBSISTING on those Hostess Coffee Cakes when I was younger. THEY WERE THE BEST THINGS EVER! I mean, they’re probably still around but… I wouldn’t ever eat one again! LOL! I really should whip up a batch for the weekend. A bunch of us are getting together after church and this would perfect with our coffee! YUM!! this looks amazing. Off to borrow the recipe. Oh this looks amazing and would be great for those office morning meeting as well! I LOVE coffee cake anyway that you can give it to me!! I can’t wait to try this one. It looks SO good! 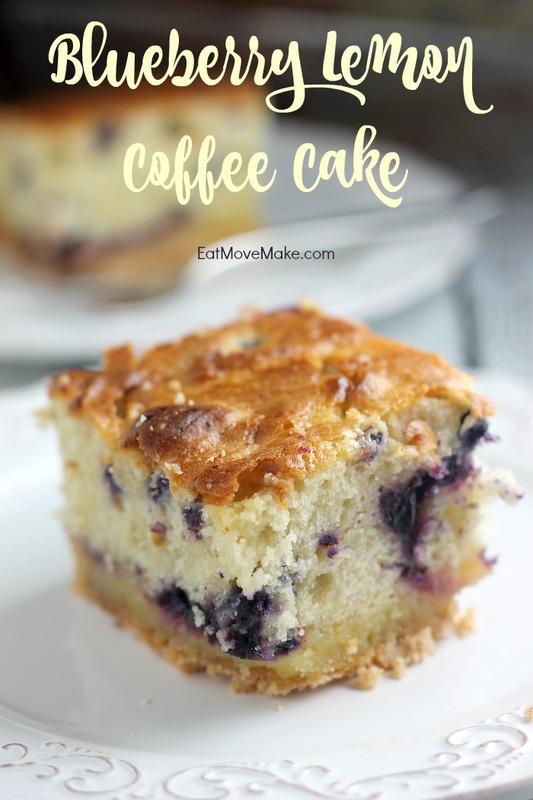 Blueberry and lemon is one of my favorite flavor combinations, but unfortunately my family doesn’t agree so I usually make regular coffee cake which is still pretty darn good but this cake sounds so yummy! That looks absolutely fantastic on every single level! I love those blueberries, and I love how they’re in between those two layers of deliciousness. Blueberry and Lemon, my favorite flavor combo. I would eat anything with the two. This looks delicious and I can’t wait to give it a try. I could and probably would eat that entire thing all by myself. Holy yum! This is RIGHT up my alley! We grow our own blueberries, and I am always watching for any recipes that include them. This sounds like the perfect thing for our monthly neighbors get-together. Thank you!